President Obama’s latest town hall meeting has caused minor controversy because, according to CNN, a casting call was issued to stock the audience. I don’t find the idea of hiring actors to fill the audience at a town hall meeting particularly shocking. Even without actors, town hall meetings are one of the most cynical, dishonest practices in our democracy, and they have been for a while. Town hall meetings are a comforting image. They bring to mind autumn in New England or perhaps The Village, but without monsters or a twist ending. Everybody knows that these meetings are a chance for “everyday folks” to gather ‘round, roll up their sleeves and solve difficult problems. The idea is to put citizens in direct contact with the democratic process, to bring people together and decide what to do about complex problems that affect us all. This is what rhetoricians call “deliberation,” and it is a vital part of our democracy. But does anyone really deliberate at a town hall meeting? Do politicians ever change their mind or reconsider their actions based on what they hear? But aren’t town hall meetings just the place to air “substantive differences?” Aren’t they a great way to air the electorate’s interests? It’s true that people sometimes ask tough questions of our politicians. And, the smaller ones are certainly argumentative. The key difference, I think, lies in the word “substantive.” The substance that is missing is a genuine give-and-take. 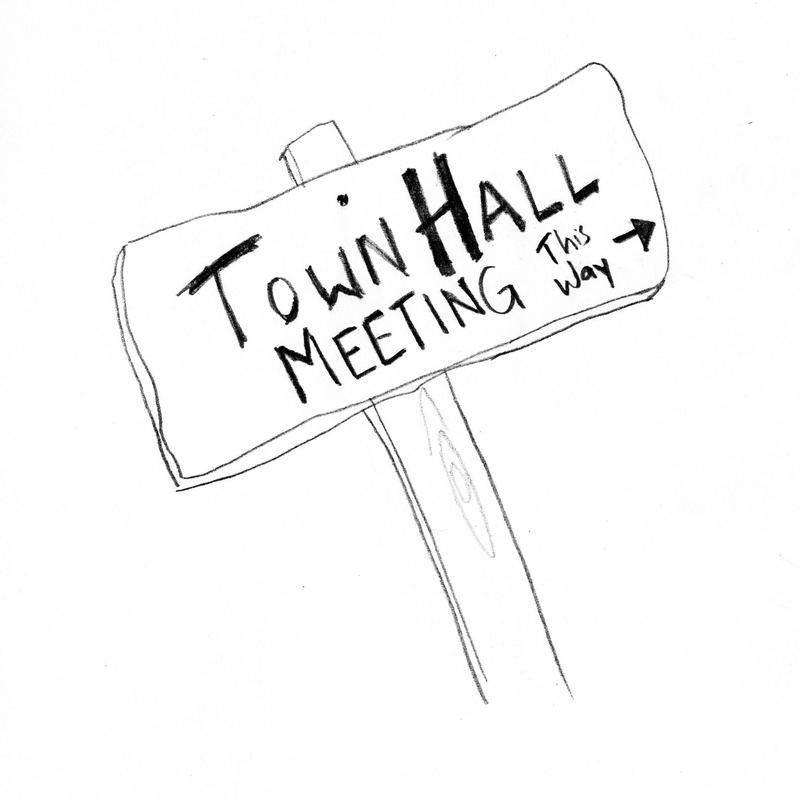 Town hall meetings are usually dedicated to justifying decisions that have already been made. He said something similar last week. He’ll probably say it again next week. Did we really need an audience of people, actors or otherwise, to get this information? You stand there with a picture of the president defaced to look like Hitler and compare the effort to increase health care to the Nazis. My answer to you is, as I said before, it is a tribute to the First Amendment that this kind of vile contemptible nonsense is so freely propagated… Ma’am, trying to have a conversation with you would be like to trying to argue with a dining room table. I have no interest in doing it. His response is funny, perhaps even thrilling, depending on your political viewpoint. But neither Frank nor the questioner seem remotely interested in dealing with substantive issues. I don’t think Obama or any other politicians set out to have a town hall meeting and then forget the meaning of the term. I think labeling a Q&A a “town hall meeting” is a way to suggest that the decisions of our leaders are consensus-driven. A real town hall meeting would require that politicians come to the table with real uncertainty about what to do next, a desire to involve the expertise of citizens in solving problems. Until they do, they ought to leave town hall meetings to, well, towns. For more on the marketing mentality toward politics, see Gerard Hauser’s book, Vernacular Voices. For complaints about the declining quality of public deliberation, see almost anything written about the public sphere, especially the work of Jürgen Habermas. Here’s an account of recent litigation surrounding the ejection of three people from a Bush town hall meeting because of a “No Blood for Oil” bumper sticker on one of their cars. Here’s a YouTube video of a small business owner “going nuclear” at a town hall meeting.